When criminal justice lecturer Greg Woods started to notice that the least informed members of the community were the most disproportionately affected by the criminal justice system, it became clear to him that he needed to teach others to understand the law. 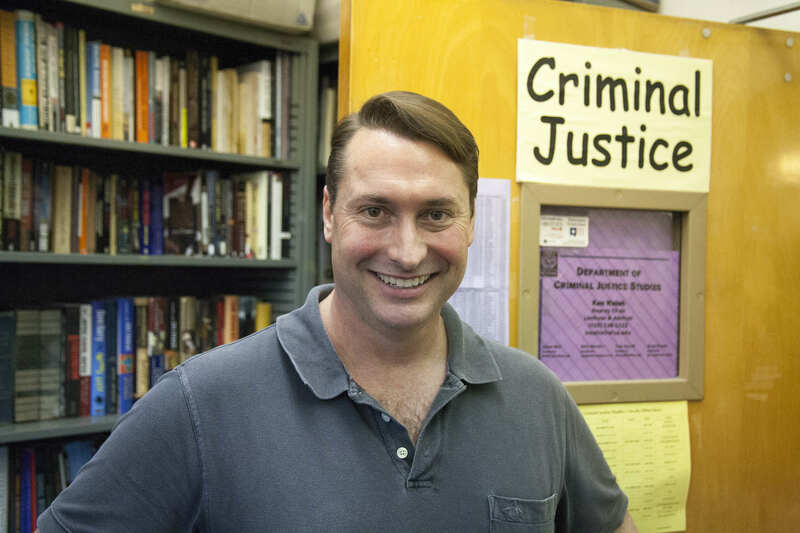 “My mission is to increase awareness and improve public policy regarding those critical issues impacting our community,” said Woods, who teaches four classes at SF State. Students in his research methods class are analyzing the relationship between law enforcement and the community with an emphasis on police department policies and their use of force. For Raquel Gonzalez, 22, her family experiences with law enforcement lead her to pursue a final thesis that sheds light on police engagement within minorities and impoverished communities. Through her research, Gonzalez hopes to find a way to establish bonds between police officers and the community. Woods describes the understanding of law as a competitive game, where it is presumed everyone knows the rules. Lecturer Greg Woods poses in his office Saturday Nov. 8, 2014. Martin Bustamante/Xpress. For Woods, having his students choose their own final thesis topic was his way of making them more socially conscious about topics important to them. About a year ago Francisco Morales, 22, received an initial complaint by the people of San Mateo County in which he said he had been falsely accused of a crime he didn’t commit. Morales was found not guilty, but said he was forced to travel to and from court hearings to San Mateo for over three months, which he said was costly since he didn’t have a car and was a full time student at SF State. His personal experience became the platform for his research between money and its unjust favoritism for the wealthy. “If you have more money you have a better representation and if you have more money, in some cases, the level of punishment is reduced,” he said. Morales said his drivers license picture might have played a role in his experience because he looks like a thug in the photo. The most essential theme explored in the course is the ability to find viable solutions to the problems they observe rather than incorporate retributive models of criminal justice. We all know that the real problem is the PC Police in Obamas America. Puff peice on Greg Woods nominated for worst article i’ve read all day, IMO.